And then, upon looking into his eyes, he understood. In there, there was no longer anything. No pain. No suffering. No hope. All those things had been consumed. 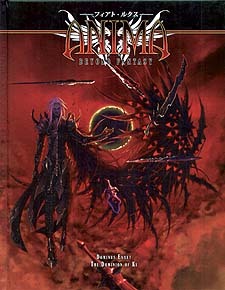 Dominus Exxet is a book dedicated to the world of the Dominion of Ki and its fantatic powers. In it you will find an infinite amount of new possibilities, as much for your characters as for their adversaries, elevating to a new level the spectacular and dramatic quality of combats. Forget everything that you believed you knew about Ki before now. With Dominus Exxet in your power, you will be able to create the most incredible combat techniques, invoke prodigious creatures, or awaken ancestral powers. Prepare yourselves. All that and much more are now in your hands. New Dominion Techniques: More than a hundred powerful Techniques created for the direct use of any character. Also are included detailed rules for the creation of customized Ki Techniques, with dozens of new effects and exclusive advantages. Ars Magnus: A complete and exhaustive list of unique capabilitits that will allow fighters to carry out the most incredible wonders, from controlling primordial energies in combat to transforming so as to acquire new levels of power. Impossible weapons: Rules to use effectively in combat the most improbable weapons, like throwing roses or invoking hundreds of swords with only the power of your soul. Martial Arts: Sixteen new martial arts and alternative systems of learning that allow the characters to improve the advantages that their fighting styles grant them at the same time that their abilities increase. Legacies of Blood: More than twenty powers latent in the blood of the characters. Raise the dead and use them like marionettes or devour existence to increase your own spiritual energy. Advanced Combat: All the rules necessary to carry out combats at the highest level. Create earthquakes with your blows, go through mountains, or move so fast that your antagonists are incapable of seeing you. Seals of Invocation: Rules to invoke creatures using Ki with the five seals of the Samsara. And Much More: New Ki Abilities, Combat Styles, Advantages, Limits, rules of learning for Ki, and the frightful powers of Nemesis, to name just a few.